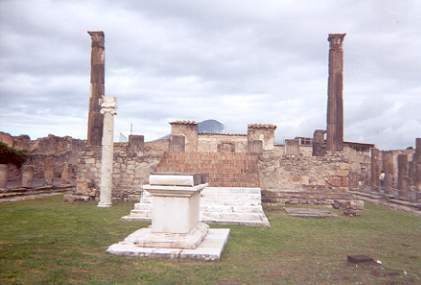 Pompeian citizens lay where they fell. And it fell to the ingenuity of archeologist Giuseppe Fiorelli. in 1806, to provide us with plaster casts of the actual bodies of some of these ancient citizens. His method was to locate hollows left under the ash by the decomposed bodies, drill small holes into the cavities and then pour in plaster. The result was a plaster cast that perfectly reflected the original outline of the body. Once set, these casts could be dug up as statue-like body sculptures which, rather gruesomely, contained the skeletons of the individuals so preserved. These figures, along with casts made of other objects buried under the dust, are on display in a Naples museum. 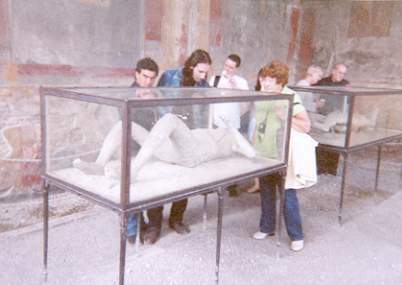 A number of the figures are also on display within the confines of Pompeii itself. 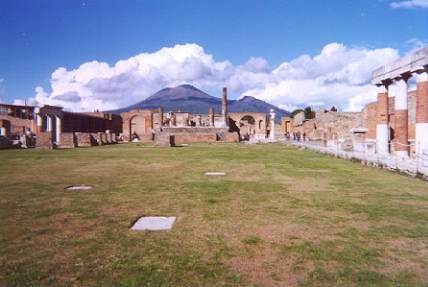 Pompeii was probably founded by the Etruscans during their expansion into Campania in the 7th century BC. The city enjoyed a dominant position on the coast near the mouth of the Sarno River and was an excellent landing place for ancient navigators. It fell under Greek influence but had an Italic destiny. As a result of falling under control of the warlike Sannites from 425 BC, it has retained the marks of this civilisation. Rome's eventual victory over the Sannites brought the city under Roman control although it kept its own language and finally gained its own autonomy. Eventually, after considerably more political instability, it became a classical residential centre inhabited by noble Roman families who brought wealth derived from agriculture - particularly wine production - and by freemen who grew rich on trade. So the city flourished and developed like a mini-Rome, complete with gladiator fights in its amphitheatre, as described by Tacitus in his Annals. 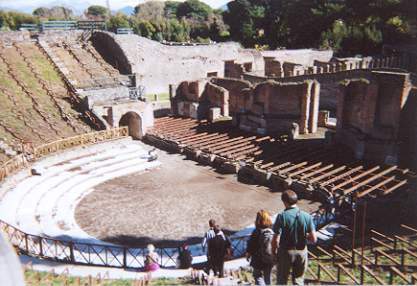 A riot in 59 AD, akin to the kind of thing we have experienced today at a football match, resulting from the clash between Pompeian fans and those from nearby Nocera, caused the local Senate to decree that the amphitheatre would be closed for 10 years as a result. (Boy, did they know how to take punitive measures!) Then, in 62 AD, the city was shaken by an earthquake that caused appreciable damage, but this was merely a wake-up call of what was to come. But the call went unheeded. 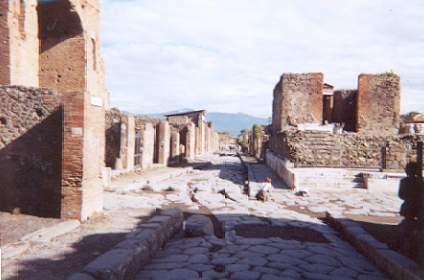 In fact, the citizens of Pompeii were still actively involved in reconstructing their city's damage from this earthquake, including restoring a well-distributed supply of running water, when Vesuvius decided to awaken from its slumbers. Yet none of the inhabitants of Pompeii were the slightest bit aware that the forested mountain nearby was really a brooding volcano. Perhaps I had hoped for things to be a little more intact at Pompeii, but in other ways, this city far exceeded my expectations, especially in overall size. It is an enormous 'ruin' by any standards. Getting there from Sorrento was a pleasant little trip through orange, lemon and olive groves, suspended nets spread everywhere to catch the fall of the little green olives. It seemed that every house had a garden full of fruit. The route followed the coastline until we turned inland for a mile or so before reaching this ancient sea port. And if that sounds crazy, blame it all on Vesuvius. This volcano, like most others, has little respect for boundaries, and that includes the sea. So after Vesuvius had finished its stuff in 79 AD, Pompeii was no longer on the coast and it was buried under 6 metres of ash. Hence the reason why, centuries later, it was not easy to locate the mythical city: when searching on the coast! Knowledge of it - and of nearby Herculaneum, which met a similar but more muddy end - was passed down thanks to the letters written to Tacitus by Pliny the Younger, who witnessed the three days of disaster from a safe distance. 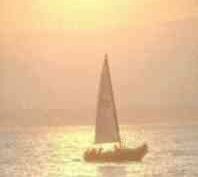 Not so his father, Pliny the Elder, Admiral of the Fleet of Misenum, who got no older, by reason of this unexpected eruption. It was an eruption so sudden and violent that the upper part of the volcano collapsed, forming the present broad caldera. Now you might think that seeing what Vesuvius can do to those living in its shadow would serve as some kind of warning to the wiser inhabitants of the area today, wouldn't you? Yet the fact is there are now countless people living no safe distance from it: a volcano that it is fully believed will one day awaken once again; probably with just as disastrous results. So if you plan to go there, go now, go quickly! Not that anyone is unaware of the dangers, you understand - they are all aware that Vesuvius might erupt at any minute and bury or suffocate them but, hey, there are economic factors to be considered here. Those at greatest risk might have been offered a few thousand Euros to depart the area, but that is hardly adequate compensation for them to abandon their homes. And it has not erupted for a couple of thousand years now, so why worry? (Italian shrug.) In any case, they are continuously monitoring it for danger signals, so rest assured it's all in under control. And there is the emergency plan to give residents the ultimate in reassurance - the Italian emergency plan - in which everyone has been given a destination to head for in the event of a Vesuvian Emergency. Yet do you reckon that sound like a good contingency plan? Can you imagine these inhabitants quietly going about the business of evacuating this area in their cars and on their mopeds - and efficiently reaching their assigned emergency lodgings? Just consider what I told you about Italian driving in and around Rome, for a moment. Next, consider that this was at a time when there was no panic greater than whether they might be late for work or tea. Now add hundreds of degrees of panic and imagine what this evacuation might look like with Vesuvius spewing smoke, fire and ash. Would you care to be around then? Frankly, I would not. Motoring, I imagine, would be like what we Brits call 'stock-car racing': probably because the drivers need a good stock of cars! Anyway, putting that little hysteria to one side, let us consider what has been revealed from the previous era in Pompeii - and hope the nearby citizens of today do not end up covered by ash and have to wait two-thousand years to be discovered. The Forum itself is incongruously unlike its appearance before the eruption, and the scheme to make it look 'nicer' by putting grass where once there was a huge paved area seems rather silly. In the background you can see just how much Vesuvius overlooks the city, and you can imagine how scary it might have looked when it began to come to life in 79 AD. Ahead of you lie the ruins of the Temple of Jupiter, and around you would have been located the important buildings that formed the heart of the city including, behind you in the picture, the Municipal Offices (Curie), the previously mentioned Temple of Apollo to your immediate left, and, progressively to your right, the Edifice of Eumachia, the Temple of Vespasian, the Sanctuary of the Lares, and the covered market (Maceellum). The Forum included prominent statues, a place for free-speech (a suggestum), the whole surrounded by a shady colonnade, with triumphant arches leading out to streets on either side of the Temple of Jupiter. Inscriptions in red and black on the walls urged the citizens how to vote, for politics were of great importance here, as in Rome. Wealthy senators would donate public facilities in order to retain the support of their voters, and they would often make sure, by means of suitable inscriptions, that the voters knew just how much it had cost their benevolent benefactors. Even the covered market was constructed on a grand scale, with huge colonnades surrounding it to provide shade for stall holders, probably with a central cloister. Not far from here you will find a couple of the city's oldest surviving inhabitants, thanks to their plaster casts. (See inlay above left for more detail about how them came to be plastered!) Two poor Pompeii citizens lie here to be gawped at by all and sundry. Their positions - pushing invisible pumice from above - remind us of the terrible death they must have suffered. They were quite small and dainty people in those days, you will note, lacking the E-numbers to give them modern stature. Look closely and you might just see the bony fingers of one of the skeletons emerging from its plaster cast. Creepy! Just behind these encased figures you will see surviving wall paintings clearly exhibiting a highly developed artistic sense of perspective. Their art, then, was not so dusty! We think we have invented so much these days, but the truth is revealed in Pompeii. The Romans invented most things before us! The streets of the city were both one- and two-way (so we didn't invent the one-way street). The pavements (which we didn't invent) were raised above the road so that the water in the streets (from overflowing fountains and waste spillage) did not soil the inhabitants shoes. They could cross from one pavement to the other without getting their feet wet at pedestrian crossings (which we did not invent), comprising raised stepping stones. The number of stepping stones on these crossings, and their spacing, allowed cart wheels to pass between them - you can see the grooves worn by the wheels to this day - and the number of stones, quite apart from the width of the street, informs us whether it was one- or two-way. (You can see one of the stepping-stone crossings in this picture.) They even had stone bollards (which we didn't invent) to prevent carts entering pedestrian areas (which we didn't invent), as shown in the picture on the right. 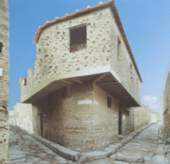 At its height of operability, the city had running water everywhere, including public water fountains such as this one, constructed from great stones pinned together and made water-proof with lead. You can see how the stone is worn away on either side of the spout here due to people leaning across for a cooling drink. A baker's shop can be found nearby, complete with oven and the area where they worked the dough. 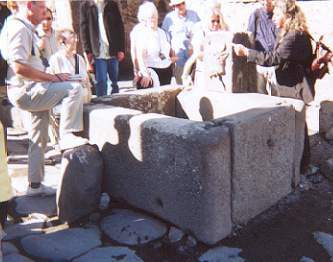 In fact, some 81 loaves were found in Pompeii. ( I reckon we had some of these at the hotel we stayed in at Fiuggi, by the way, for no one could make any impression on this bread and it regularly reappeared on display at our tables.) There were shopping streets all over the city, such as the one shown to the right: still very busy today - although somewhat low on stock! Don't even think we invented the take-away, because here is a fine example of a Pompeian one. (Here the tour guide invites present-day visitors to imagine what they might order. Perhaps a lion burger with olives and a flask of lemonade for me.) Roman life, you see, was much like life today! Although, it has to be said, there was more need for public baths in those days. (Well it does get very hot there!) The interesting thing about the baths in Pompeii is that these buildings are some of the few to survive, complete with roofs. The reason was that they had arched rather than flat roofs, the idea being that stream could condense and be channeled across to the walls rather than rain on the paying customers. This arch structure meant that much of the pumice bounced off, and these structures were, in any case, inherently stronger. Within one of the hot rooms of the male baths is a grand fountain so that customers could have a brief splash of their overheated brow. This is a fine example of a political donation, by the way, for the inscription on it clearly indicates how costly it was to provide: an enducement as to where to put your next voting cross for such a great benefactor! Another kind of public building much in evidence was the lupanar (or 'brothel', in modern-day parlance, the Latin term derived from 'she-wolf'). This was quite legal then, of course, and a sea port such as Pompeii had its share of visiting sailors - and we all know what they're like! Sailors of many different nationalities would descend on the city, and speaking many different languages, so the ingenious brothel keepers found ways to get over the language barrier. If you are observant you might see a rather strange - but very pictorial - arrow set in the ground pointing up the street to this lupanar (I could not possibly tell you how symbolic this arrow really is), and above each of the little stone 'bedrooms' in this particular lupanar can still be made out the fading pictures that displayed the special delights on offer in particular rooms. Notice how this establishment is conveniently situated on a corner, how the 'upper-class' rooms on the upper-storey are larger due to the overhang, and how, on a rainy day, even a queue could form outside without getting overly wet! (The rich citizens would have had little need to visit one of the city's 25 lupanars, however, since their own servants would have legally provided for their every need - at no extra cost and quite legally!) Furniture in this building was virtually non-existent, the stone bed being lovingly dressed with a straw mattress. Hey-ho! What those folks put up with for a roll in the hay! 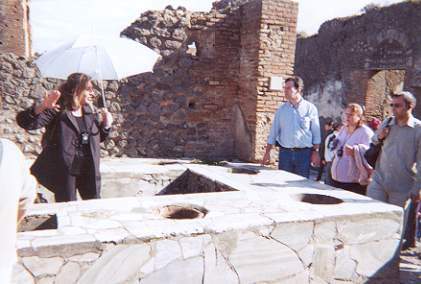 The well-to-do inhabitants of Pompeii lived in a luxury at the other end of the scale from this. Some of the richest citizens lived in enormous houses, some taking up an entire city block. One such is the House of the Fauan, named after the statue found in the grounds. This house dates back to the 2nd century BC, as evinced by the Hellenistic elements that appear alongside Italic aspects. The entrance vestibulum contains a fine stucco and a colourful marbled floor. You then enter the main atrium in Tuscan style which contains the bronze statue of the little Faun from which the house takes its name. (The statue is actually a copy, for the original is in the museum.) 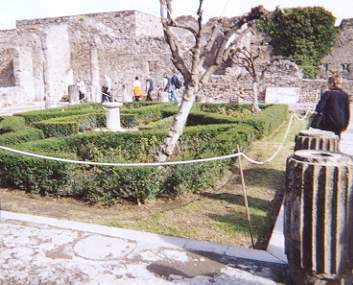 Nearby is a large garden (pictured) with fountain and, originally, a Doric colonnade. This house had four dining rooms to give adequate choice according to season, and countless rooms. As you wander round the grounds of this house you realise that the wealthy really did have quite a luxurious life-style in those days. From what is known as the Triangular Forum, wherein was locate the Greek Temple, you gain access to the Great Theatre, a fascinating place which really evokes events past. This was built in Hellenistic times (200-250 BC) on the natural slope of a hill and today boasts a Roman stage. Like the Colosseum in Rome, although basically an open-air structure, it was possible to cover it in inclement weather by pulling across a velarium. (Temporary seating is put into places for events to this day - including pop concerts. I wonder what the Romans would have thought of rock? I think it may have left them cold.) This theatre could seat up to 5,000 people. Adjacent to this was the Little Theatre (or Odeon), built after the city had become a Roman colony, in 80 BC. Its capacity was around 1,000 seats and is among the best of the theatres of antiquity because of the way the Hellenistic decorations harmoniously match the overall structure of the building. Just over the wall from the theatres is situated to Gladiators' Barracks. Why, may one ask, was this located at the opposite side of the city to its Amphitheatre - apart from the fact that the citizens enjoyed the parade of Gladiators through the city prior to a performance. Mind you, given the 10-year ban at the Amphitheatre, maybe the idea was to keep idle hands out of mischief and get them to act as usherettes at the theatres! And their nearby presence might well have proved handy when that enormous velarium needed pulling across the Great Theatre. (Remember, it was sailors who did it at the Colosseum, so it would certainly have needed some beefcake to do it - especially given that many of us today could have dwarfed even the gladiators!) The barracks included cells, so anyone causing mayhem at a theatre performance could have been quickly and effectively pacified. If you are interested in an informal look at what life was like in ancient Pompeii, check out these book reviews! Courtesy of the Cole Family web site, this is a most amazing and detailed overview of Pompeii - from a Christian perspective. If you enjoyed reading the above article then you will probably also enjoy Lake Garda by Ed, and Lanzarote, also in Europe, and our latest articles covering the Orinoco Delta, La Mata, Marbella and Beijing. This guide to the ruins of the Italian city of Pompeii is refreshingly straightforward and rife with insight. Zanker, a professor at the University of Munich and director of Rome's German Archeological Institute, offers a plausible and interesting description of what life in Pompeii was probably like in A.D. 79, including a comparision between the conventions of that time and today. This novel is set in Pompeii at the time of the erruption. Roman engineer Attilius rushes to repair an aqueduct in the shadow of Mount Vesuvius, which, in A.D. 79, is getting ready to blow its top. Attilius meets Corelia, the defiant daughter of a vile real estate speculator, and later fights his way back to Pompeii in an attempt to rescue her. The volcanology is well researched and the plot keeps this impressive novel moving along toward its exciting finale.